Establishment watering is particulaly important for 6-8 weeks following installation (depending on natural rainfall) and differing system finishes will require different watering practices. It is important to make provision for ensuring the vegetation is watered and cared for in the period immediately following completion. For extensive and biodiversity landscaped roofs, the ongoing watering needs are dictated by the type of vegetation and then the location, aspect, roof slope and exposure of your roof. Substrate based roofs with sedum plants rarely need artificial watering, whereas wildflower may need occasional watering during prolonged dry spells. Expectations regarding appearance is also an important factor, as some clients wish to maintain or enhance the visual appearance, whereas others may prefer to leave it to nature. Every roof is different and levels of irrigation depend entirely on the water demands of the vegetation as well as the levels of water storage on the roof and local rainfall levels. The more intensive a roof finish, the more likely irrigation will be required and the plants must have sufficient levels of water to ensure they remain healthy during prolonged dry periods. An automated system is generally the best option in the long-term and the frequency at which it is applied will depend on the plant species. These are designed and supplied by specialist irrigation companies who will offer a specific system to meet your requirements. All roofs require a minimum of two inspections a year to ensure that the outlets etc are maintained, regardless of the type of green roof. An intensive green roof will require the regular maintenance associated with the planting scheme and landscape design, whereas an extensive green roof will need only minimal maintenance to ensure that any unwanted species do not become established. We strongly advise the inclusion of the cost for an initial post-installation maintenance program within the tender documents for a period to be agreed with the client’s representative. This ensures that the green roof is handed over in a healthy and fully established condition. Provision should always be made for safe access to the roof for routine maintenance, which may include man-safe systems with harness and attachment points, internal access hatches or an externally mounted bracket to secure a ladder. As all green roofs will need to be to be accessed at least twice a year for routine maintenance, it is a fundamental requirement of the design of the roof structure that safe access is provided for. The two important points are; safe access on to the roof by people and maintenance equipment and the safety of individuals once on the roof, ie handrail balustrades at the correct height, stable surfaces that are slip resistant etc. 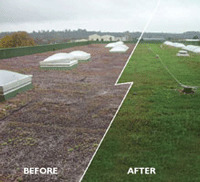 Bauder’s experienced team will provide you with a tailor-made maintenance programme for your green roof with the work undertaken by Bauder’s experienced maintenance engineers who will carry out the necessary risk assessments and comply with all current health and safety legislation throughout the duration of the work. A green roof is a real asset to a building and for it to continue to deliver the environmental and aesthetic benefits for which it was originally designed, it is important to carry out maintenance on a regular basis.